The Dorothy Moses Morrison Chapel is a showcase for five historic stained glass windows donated in 1991 by Mrs. Morrison. The windows were restored in 2001 and placed in the renovated chapel. The room is equipped with an organ, upright piano, and Steinway grand piano. 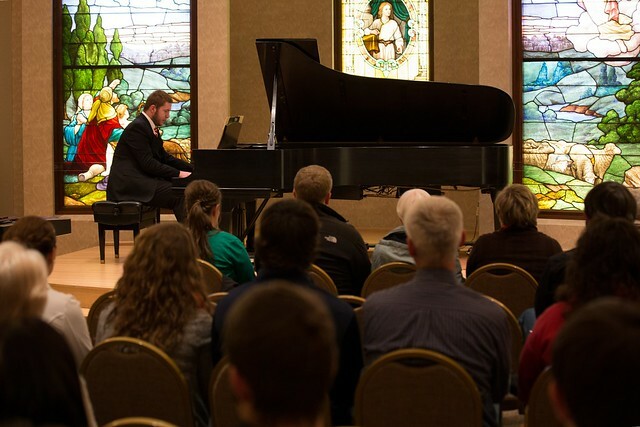 The intimate space has become a popular setting for solo recitals, small chamber groups and public performances. It also serves as the Choral Room for the Barton Music Department. Find more detailed information on each window. Members of the public can rent the chapel for events, such as small weddings or performances. To reserve the Chapel, call (620) 792-9340, or send an email. Tours of the chapel are free and available by appointment. Call the Shafer Gallery at (620) 792-9342 to schedule a tour.